Manager Chris Wilder has admitted the Cobblers players are effectively ‘policing themselves’ as they maintain their impressive push for promotion from Sky Bet League Two. Town go into this Saturday’s clash at Leyton Orient sitting top of the pile, five points clear of second-placed Plymouth Argyle with a game in hand. 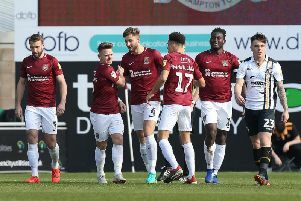 They are also 13 points clear of fourth-placed Mansfield Town having played three games less and, having won 11 of their past 12 games, things are looking very, very good at Sixfields. Wilder has obviously engineered the current position with his excellent recruitment and implemenatation of his playing style, but he admits at the moment he hasn’t got ‘a great deal to do’. “You look at the players, and you always think you have got to say things as a manager, but I think sometimes you just end up saying things for your own good,” admitted a relaxed Wilder this week. “I said to Alan Knill coming off the training ground last Friday, ‘I don’t need to say anything, they get it’. “The players are policing their own changing room, they are policing their own training ground and the games, because they have been through it before. “They know their way round a football pitch, and they know their way round a football season, and they know how it works. “The players are stepping up to the plate, they are relishing the next opposition, relishing the next challenge, and if I’m honest I’ve not had a great deal to do! Wilder is of course massively understating his part in the dramatic turnaround at Sixfields, but he is serious when he says he can now stand back a litttle and just watch things happen. “We have had to put a lot of work into them to get into this position, but the players are running the changing room and making it happen, and so they should, whether they are the younger lads or the ones that have been there before,” said the Cobblers boss. “I genuinely believe they are really enjoying the challenge, they are not playing with any nerves or pressure. “In the next 18 games, we are going to lose a match there is no doubt about that, we might lose two, and it is then about how we recover. And he added: “It’s about making good decisions. “There has to be leadership at the top, a direction in terms of which way we want to go in terms of team selection, how we play the game and substitutions and how we react to stuff. “We have really good professionals, and they will dig each other out.